In live theatre things can and do go wrong. ‘One Man, Two Governors’, Richard Bean’s updating of Carlo Goldoni’s 1753 Italian comedy ‘The Servant of Two Masters’ to 1963 Brighton, is great proof of this. In the audience for the National Theatre’s latest hit, you feel like this is the one and only night when disaster and chance combine to make this performance the most magical and hilarious ever. You are a witness to a never to be repeated string of incidents where it goes so wrong but is so right. The cast, led by Gavin and Stacey co-creator James Corden in his first stage role since The History Boys, conspire to fool you – let them. Corden plays Francis Henshaw, a check suited ex skiffle player driven by hunger. His hoodlum boss won’t pay him until the end of the week, and he’s forced to take on a second yet identical job as messenger and minder to toff-on-the-run Stanley Stubbers (Oliver Chris). Stanley has killed Roscoe Crabbe, a small time sadistic hood- only Roscoe as been resurrected by his twin sister Rachel (Jemima Rooper) who needs the disguise to collect £6,000 to fund an escape to Australia with her boyfriend Stanley. Neither party realises their lover is sharing the same hotel and servant and Francis needs to keep them apart to pocket both paycheques. A dinner served to both masters simultaneously with the wonderfully wavering assistance of an octogenarian waiter (Tom Edden) is the comic peak of the play with slapstick galore. The second act starts with a now sated Francis asking the audience what will motivate him “as the Harlequin” now that he has been fed. The entrance of a buxom beauty (Suzi Toase) supplies the answer. Commedia dell’arte or ‘the comedy of skills’, from which Harlequin hails, is a half improvised form of theatre in which the actors work from a bare outline incorporating physical humour and gags of their own; Bean has captured that spirit. Shawn of this fresh anarchic feel that so infused the first half the second act can never quite reach the same heights of hilarity. 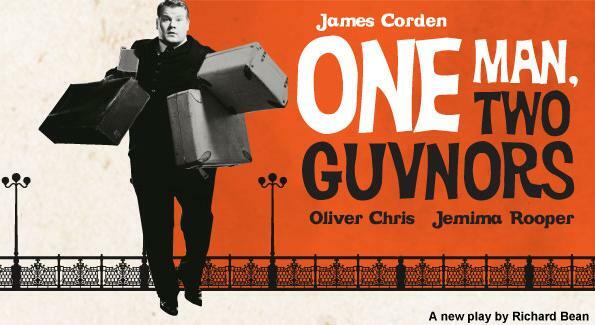 The original music, sparky script and Corden’s mischievous charm do however hold you until the happy ever after.